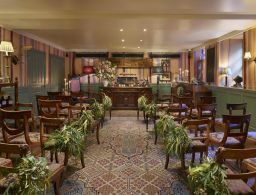 The Zetter Townhouses are delighted to announce their recently acquired wedding license in Clerkenwell. The option to exclusively hire either of the townhouses for any occasion makes them the perfect home away from home, ideal for small wedding ceremonies, an intimate reception for family and friends, a dreamy mini moon destination or a glamorous hen do. The Zetter Townhouse Clerkenwell is a 13-bedroom Georgian townhouse and cocktail lounge with sumptuous interiors by Russell Sage. There are 2 spectacular suites, 11 bedrooms, a Games Room and a Dining Room. The Zetter Townhouse Marylebone is a 24-bedroom Georgian townhouse and cocktail lounge that enjoys an enviable location on Seymour Street in London’s fashionable Marylebone. The property features 19 bedrooms, 4 studio suites, a spectacular rooftop apartment, (complete with roof terrace and alfresco bathing) and a destination cocktail lounge, Seymour’s Parlour.